Downtown San Jose is now home to The Market, a well-designed and unique grocery store operated by Safeway. Occupying almost the entire ground flood of The 88 (2nd & San Fernando), the new store is impossible to miss. The feeling that you are embarking on something new actually begins in the parking lot. Unlike any other grocery store in San Jose, you park in a garage directly below the Market and ride an elevator to the center of the store. However, what really makes The Market different from your cookie cutter Safeway is a strong focus on ready-to-eat foods. You'll find a fully stocked Delicatessen, fresh baked pizzas, a Sushi Bar (yes, that's right, a Sushi Bar), the entire Signature Cafe catalog, and even a Tully's coffee shop inside the store... all supported by plenty of seating both inside and out. The focus is clearly on instant gratification. As packed as the new store was this weekend, within 10min you could easily walk in, grab everything you need for dinner, and be on your way. The 6 self checkout stands and 6 (at least) manned checkout stations played no small part in this. The idea is that instead of doing all of your grocery shopping everyone week or two, you could swing by The Market every couple days... grab whatever fresh food you're in the mood and either take it home or enjoy it right there in the store. The concept is very well suited at an urban lifestyle and I'm sure is destined for success. I also need to mention that I have never met friendlier staff at a grocery store before, they really make you feel welcomed there. 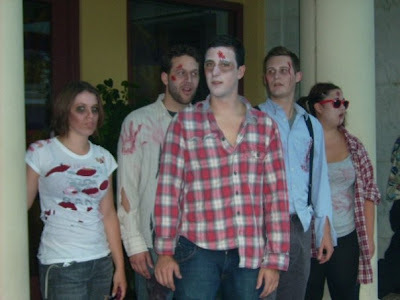 Here are a few Zombie Crawl photos courtesy of Helen Garcia. It looks like a huge success! 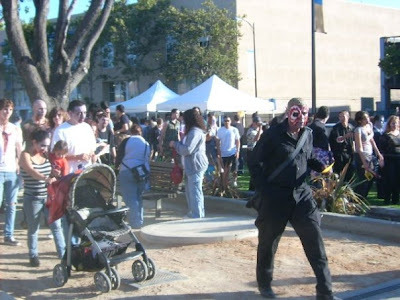 I'm hoping we'll see this event again in downtown San Jose again next year! 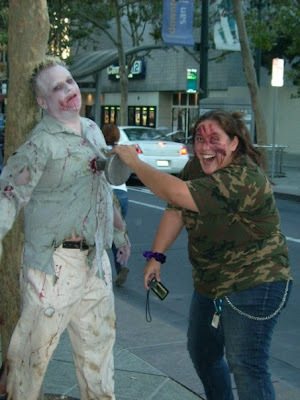 We have a pretty interesting event coming to Downtown San Jose next Wednesday, San Jose's first Zombie Crawl! What better way to get ready for October? This event is centered around a screening of Shaun of the Dead, one of the most entertaining zombie movies I've seen. 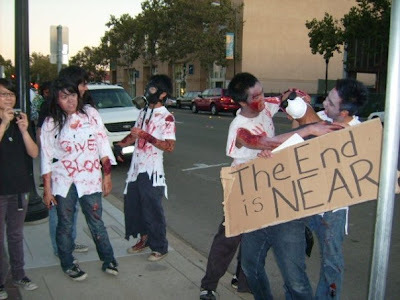 However, the real fun is going to be joining the zombie hoard and marching through downtown dressed up as a zombie. 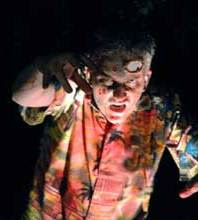 There is even a make up artist on hand to help give you that authentic "zombie look." I've never heard of anything like this before, but I already hope it becomes a San Jose tradition, sounds like a lot of fun! There will also be a zombie themed art show at SLG Publishing Boutiki and Gallery, as well as specials for the undead at Cafe Trieste, The Blue Chip, Brix Nightclub, Agenda Lounge, and South First Billiards. 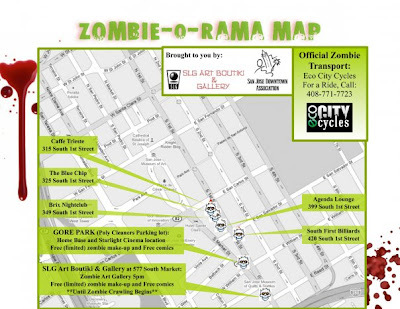 Checkout the official Zombie-O-Rama map below! The Market (Safeway) opens it's first Downtown San Jose store on August 28th! There are some concerns that it might put Zanotto's out of business. SJSU will have to cut enrollment by about 10% due to budget cuts. Silk Road Cafe has opened at 185 Park Ave. (same owners as Silk Road Bistro on San Fernando). The Art Glass Center of San Jose has set up shop at 465 S. First. St.
D'Town Express offers dry cleaning and alterations at 15 Fountain Alley. Headcase Salon is now providing hair and tanning services at 151 W. St. James St.
Legacy Partner's Riverpark Tower 2 is now leasing 316,000 sqft of Class A office space. The Civic Auditorium was lit July 24rd with a new high-tech LED lighting system (as reported here earlier). Downtown hotel occupancy is down from 67.04% last year to 55.65% this year. Civic Center's New Exterior Lighting! As promised yesterday, I have a couple photos of the new lighting system at the San Jose Civic Center. It looks like all of the lighting is using LED technology, meaning the color can be changed to almost anything with ease (as well as being the most energy efficient lighting available). In fact, it looks like different zones of lighting can be changed independently, as one side of the Civic was green and the other was pink. It definitely makes an impression when walking by the Marriott or convention center. I would mind seeing this exact same lighting system used in other buildings throughout downtown (I'm looking at you Tech). I think we're coming a long way in Downtown San Jose in terms of sprucing the place up. 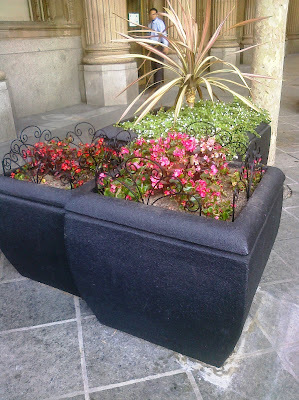 Over the last several weeks I have been noticing flowerpots all over 1st St., 2nd St., and the SoFA district. It's a nice Santana Row-ish element that makes the streets more walkable and aesthetically pleasing. On 1st there are also quite a few flowers handing from streetlights as well as some slick lighting. This is just one of many examples of low cost improvements that can have a high impact on the neighborhood. Well done! While we're talking about aesthetic improvements... my wife and I walked by the Civic Center today and new lighting system looks incredible. We took some photos, so hopefully I'll get them up tomorrow. This is a good direction for downtown.